ARLINGTON, Va. (May 03, 2007) -- Two Army veterans and their wives visited the Air Force Memorial April 24, as part of a "Sons in Retirement" group tour of the nation's capital. Robert Nelson of San Jose, Calif., served in the Army from 1959 to 1961, narrowly missing a tour in Vietnam. 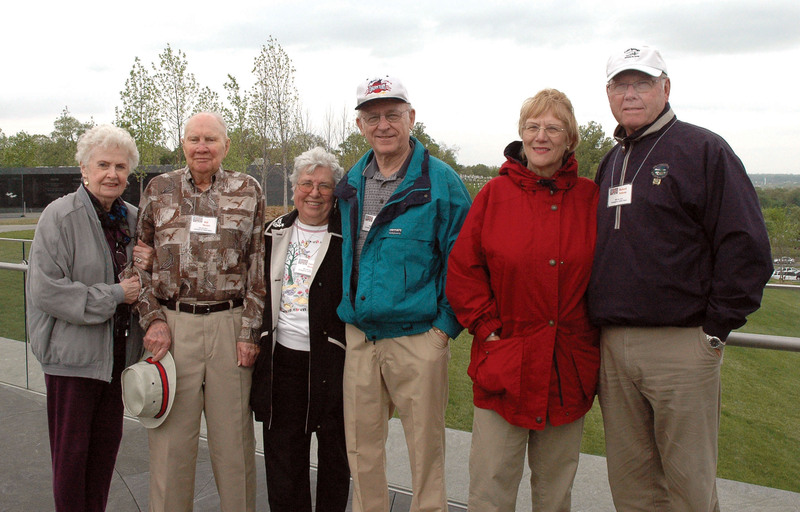 Mary Lu Moore and Bill Moore, Loretta Orndac and Andy Orndac, and Darleen Nelson and Robert Nelson, all from San Jose, Calif., visited the Air Force Memorial April 24, as part of the "Sons in Retirement" group tour of the nation's capital. All three men are military veterans. Moore served in World War II, Orndac served in Germany at the end of the Korean war, while Nelson served stateside immediately prior to the United State's entry in to Vietnam. "I was drafted, and it was right before Vietnam," he said. "I was sitting there with my knees knocking." Nelson served as an ordnance technician in the Army, reaching the rank of Private First Class. "I could never stay out of trouble," he joked. After his service, he became a high school teacher. This was his first trip to Washington, D.C.
"We came to see Washington, D.C., and all the history that's here," he said. "I think this is awesome, and I wish I had a camera to catch it all." Nelson's wife, Darleen Nelson, a retired legal secretary, had been to the city in 1980, with their then 10-year-old son. But the city still thrills her. "I love everything here, it is an overwhelming experience," she said. Andy Orndac, also an Army veteran, agreed. "There is so much history here, so many things we've been seeing in newspapers and on television -- the buildings and everything," he said. Orndac served in the Army from 1953 to 1955, he missed a tour in Korea. "When I finished basic training, they were doing peace talks in Korea," he said. "So I ended up going to Germany instead -- I lucked out." Orndac and his wife, Loretta, were visiting Washington for the first time as part of the tour they were on. She said overall, Washington was "well worth the trip." Andy was impressed with the White House and the Air Force Memorial. "I saw in the paper the Air Force had just finished the Memorial," he said. "I think the memorial is great -- it's just beautiful."